The Shoshone (also spelled Shoshoni) are a Native American tribe with three large divisions: the Northern, the Western and the Eastern. The Northern are concentrated in eastern Idaho, western Wyoming, and north-eastern Utah. The Eastern lived in Wyoming, northern Colorado and Montana. Conflict with the Blackfoot, Crow, Lakota, Cheyennes, and Arapahos pushed them south and westward after about 1750. The Western ranged from central Idaho, northwestern Utah, central Nevada, and in California about Death Valley and Panamint Valley. This group is sometimes called the Panamint. 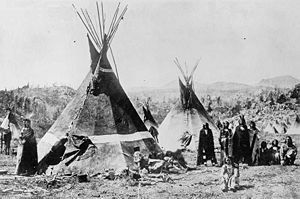 The Idaho groups of Western Shoshone were called Tukuaduka (sheep eaters), while the Nevada/Utah groups were called the Gosiute (Goshute) or Toi Ticutta (cattail eaters). The estimated population of Northern and Western Shoshone was 4,500 in 1845. 3,650 Northern Shoshone and 1,201 Western Shoshone were counted in 1937 by the United States Office of Indian Affairs. Possibly the most famous member of the Shoshone tribe was Sacagawea who accompanied the Corps of Discovery with Meriwether Lewis and William Clark in their exploration of the Western United States. The success of their expedition was due in no small part to the willing support of Sacagawea, who remains one of the most famous Native American women in history, and is a fine example of peaceful inter-cultural cooperation. 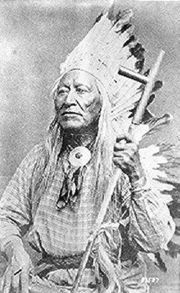 Unfortunately, despite her cooperation and the good faith efforts of Shoshone leaders such as Washakie to enter into peaceful agreements with the white Europeans, the massive influx of settlers and travelers through their lands disrupted and forever changed the Shoshone way of life. Today, Shoshone live on reservations and strive to preserve and pass on their traditional culture to further generations and at the same time engage in contemporary ventures. 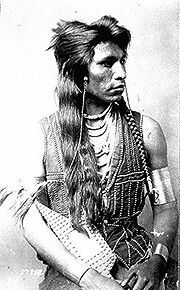 Rabbit-Tail, Shoshone member of Captain Ray's scout company; half-length, seated, with bracelets and ornamented vest. The Europeans encountered hundreds of native tribes occupying vast territories of this mineral-rich country, and they quickly recognized the potential wealth to be gained by tapping into the natural resources of the land. After the opening of the American West by the Lewis and Clark expedition, the success of which was due in no small part to the involvement of Sacagawea the Shoshone woman who became their guide and translator, the Shoshone way of life would never be the same. The Shoshone had no idea that their freedom and way of life was about to become yoked and extinguished. After they signed a treaty on August 7, 1855 in good faith, the US Government refused to ratify it. They claimed that it was because Garland Hunt, who was the Indian Agent, had overstepped his authority in offering the Shoshone Indians the treaty. Before the ink had dried on the peace treaty of 1863, the white man had already begun to inhabit Shoshone lands, and the authorities did nothing to stop the influx of the invasion. The Northern Shoshone fought conflicts with settlers in Idaho in the 1860s which included the Bear River Massacre. They fought with the U.S. Army in the 1876 Battle of the Rosebud against their traditional enemies, the Lakota and Cheyenne, and again in 1878 in the Bannock War. Disheartening as it was, the Shoshone realized that they could never defeat all of the white men. Most fought bravely and were slaughtered, while some became resigned to being dishonorably treated and accepted reservation life. They were granted a small plot of land after Nevada officially became a recognized state, an area which was thousands of miles less than they were accustomed to roaming. Sacagawea was a Shoshone woman who accompanied the Corps of Discovery led by Meriwether Lewis and William Clark in their exploration of the Western United States, traveling thousands of miles from North Dakota to the Pacific Ocean. Sacagawea was born to the Agaidika ("Salmon Eater") tribe of Shoshone near what is now Lemhi County, Idaho, but in 1800, when she was about 11 or 12, she was kidnapped by a group of Hidatsa in a battle. She was taken to their village near the present Washburn, North Dakota, where she grew up culturally affiliated with this tribe. At the age of about fifteen, Sacagawea had been taken as a wife by Toussaint Charbonneau, a French trapper living in the Hidatsa village. Sacagawea was pregnant with her first child when the Corps of Discovery arrived near the Hidatsa villages to spend the winter of 1804-1805. Lewis and Clark agreed to hire Charbonneau as an interpreter when they discovered his wife spoke the Shoshone language, as they knew they would need the help of the Shoshone tribes at the headwaters of the Missouri River. Carrying an infant child, she maintained her translating duties, while simultaneously leading the expedition through the Northwest to the Pacific Coast. The expedition left Fort Mandan and headed up the Missouri River in pirogues, which had to be poled and sometimes pulled from the riverbanks. On May 14, 1805, Sacagawea rescued items that had fallen out of a capsized boat, including the journals and records that Lewis and Clark were keeping. The corps commanders, who praised her quick action on this occasion, would name the Sacagawea River in her honor on May 20. By August 1805 the corps had located a Shoshone tribe and was attempting to trade for horses to cross the Rocky Mountains. Sacagawea was brought in to translate, and it was discovered the tribe's chief was her brother Cameahwait. August 17 Saturday 1805 The Interpreter & Squar who were before me at Some distance danced for joyful sight, and She make signs to me that they were her nation […] the meeting of those people was effecting, particular between Sah cah gar we ah and an Indian woman, who had been taken prisoner at the same time with her and who, had afterwards escaped from the Minnetares [Hidatsa] and rejoined her nation. 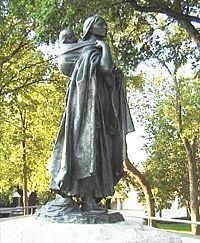 A statue of Sacagawea and baby Pomp appears on the grounds of the North Dakota State Capitol, and a replica of it represents North Dakota in the National Statuary Hall in the United States Capitol. Washakie was a renowned warrior who first appears in 1840 in the written record of the American fur trapper, Osborne Russell. Much about Washakie's early life remains unknown, although several family traditions suggest similar origins. He was born to a Flathead (Salish) father and Lemhi Shoshone mother, two tribal groups that were frequent hunting and trading partners. After his father was killed, he may have become the adopted son of the band leader of a Shoshone or Bannock and Shoshone band, but for the next two-and-one-half decades (c. 1815-1840) he learned the traditions and the ways of a warrior that were typical of any Shoshone youth of that period. Although the name by which he would be widely known has been translated in various ways, it apparently dealt with his tactics in battle. One story describes how Washakie devised a large rattle by placing stones in an inflated and dried balloon of buffalo hide which he tied on a stick. He carried the device into battle to frighten enemy horses, earning the name "The Rattle," or "Gourd Rattle." Another translation of "Washakie" is "Shoots-on-the-Run." In 1851, at the urging of trapper Jim Bridger, Washakie led a band of Shoshones to the council meetings of the Treaty of Fort Laramie. Essentially from that time until his death, he was considered the head of the Eastern Shoshones by the representatives of the United States government. Perhaps he realized that the expansion of whites into Shoshone country was inevitable, but in 1863 and again in 1868, he signed treaties with the U.S. at Fort Bridger. The 1863 Treaty of Fort Bridger established a generic Shoshone country, whose borders extended eastward to the crest of the Wind River Mountains, south to the Uintah Mountains of Utah, and on the northern side, to the crest of the Bitterroots. The western border was left undefined, but was understood to include most of the Snake River basin as far as the Oregon border. This treaty included a number of Shoshone and Bannock Indian bands besides that of Washkie. "Shoshone Indians at Ft. Washakie, Wyoming Indian reservation. Chief Washakie (at left) extends his right arm." Some of the Shoshones are dancing as the soldiers look on. The 1868 Treaty of Fort Bridger proved more significant, for it established the Shoshone and Bannock Indian Agency located in west-central Wyoming. Moreover, this was land selected by Washakie and his headmen of the Eastern Shoshones. The initial reservation included about three million acres (12,000 km²) in Wyoming's Wind River country for his people. Although an 1872 land cession reduced the size by 800,000 acres, this valley remains the home of the Eastern Shoshones today. Washaki was also determined that Native Americans should be educated, and he gave land to Welsh clergyman John Roberts to establish a boarding school where Shoshone girls learned traditional crafts and language. Washakie's prowess in battle, his efforts for peace, and his commitment to his people's welfare made him one of the most respected leaders in Native American history. In 1911 a small group of Bannock under a leader named "Shoshone Mike" killed four ranchers in Washoe County, Nevada. A posse was formed, and on Feb 26, 1911, they caught up with the band, and eight of them were killed, along with one member of the posse, Ed Hogle. Three children and a woman who survived the battle were captured. The remains of some of the members of the band were repatriated from the Smithsonian Institution to the Fort Hall Idaho Shoshone-Bannock Tribe in 1994. In 1982, the Western Shoshone, who also invited "unrepresented tribes," made a declaration of sovereignty and began issuing its own passports as the Western Shoshone National Council. Newe is the Shoshone language word which means "The People." The tag "Shoshone" was coined by the Euro-American hunters and traders in the 1830s or early 1840s. The name stuck and many contemporary Newe refer to themselves as Shoshone. However, the number of people who speak Shoshone has been steadily dwindling over the last few decades, so there are only a few hundred people who speak the language fluently today, although a few thousand know it to one degree or another. Shoshone is the northernmost member of the large Uto-Aztecan language family, which includes over thirty languages whose speakers originally inhabited a vast territory stretching from the Salmon River in central Idaho down into northern and central Mexico. Shoshone belongs to the Numic subbranch of Uto-Aztecan. The word Numic comes from the cognate word in all Numic languages for "Person." The Shoshone were largely farmers and hunters. They have a culture rich in family values and tradition, and parents and grandparents bestow the oral history of their ancestors to their children. As with most other Native American groups, the Shoshone have ritual dances to express their gratitude to the earth for planting the seeds in the autumn, and the harvest in the spring. The Shoshone lived in extended family groups in which cousins, grandparents, aunts and uncles and in-laws all banded together. They migrated through valleys and areas large enough to sustain their encampments with hunting and gathering resources. 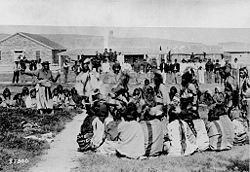 At certain times during the year such as harvest time, many tribes would join together to sing and dance, although there was no central organization throughout the Shoshone nation. Each of the Shoshone villages managed its own affairs internally, by tribal council, governed by village elders and generally a head chieftain. Varying in size and shape, the larger villages were generally fortified well to protect against an enemy attack, and they had populations up to and over 1,000, and spanned from one to ten acres (40,000 m²). They practiced agriculture and produced crops such as wheat, squash, corn, pumpkins, and barley. The typical village had 50 to 400 people organized in tipis. Villages were abandoned every few decades as the nearby forest grew thin and so they would migrate into more fertile areas. Storytelling is a popular part of entertainment in many Native American societies. This stood also true for the Shoshone. Stories would recount their origins and would retell the deeds of heroes long gone. There are also many Shoshone legends about sacred animals including possums, raccoons, turtles, birds, chipmunks, and wolves. In Shoshone beliefs, the archetypal deities appear as visionary beings who bring blessings and receive love. Shamans would receive visions in their dreams and lead the people to different areas on the map, dwelling where the spirit beings told them to. A vast collection of myths defines the relationships between man and nature and plants and animals. Man depended on the blessings of the gods, who in turn depended on prayers and ceremonies. In Shoshone mythology, the Coyote brought them to the lands of the Great Basin. Two Shoshone women gave Coyote a basket by two native women coated with pine pitch to make it waterproof. Coyote was supposed to carry this basket to the Great Basin, and was warned against opening the lid. However, his curious nature overcame him, and when he opened the lid, some of the beings inside jumped out and ran away, which is how they say their ancestors came to dwell in the land of the Great Basin. Shoshone hold the wolf in great respect, as the creator god. The coyote, however, as a trickster was avoided. Shoshone tales tell of Coyote's resentment against Wolf. In one tale, Coyote tried to trick Wolf, who had the power to bring the dead back to life. Coyote told Wolf that he should not bring the dead back to life because there would be no more room on the earth for everyone, expecting this to cause the Shoshone to hate Wolf. However, the trick was reversed, as Coyote's son died and Wolf did not revive him. The Shoshone people say that was how death came to their lands, and the experience of sorrow when someone dies. They continue to admire Wolf's power and wisdom, despite this. Today, many of the Shoshone tribes are still waiting to become formally recognized by the federal government, along with over 200 other Native American tribes. One of the most notable Shoshones is a gentleman by the name of Ronald "Snake" Edmo, a Shoshone poet, and linguistic anthropologist. He carries the oral tradition of his people with him and travels the country enlightening modern Americans about the vast culture of the Shoshone people. Contemporary Shoshone live on a number of reservations. Following are some examples. Wind River Indian Reservation is an Indian reservation shared by the Eastern Shoshone and Northern Arapaho tribes of Native Americans in the central western portion of the U.S. state of Wyoming. It is the seventh-largest Indian reservation in the United States, encompassing a land area of 8,995.733 km² (3,473.272 sq mi). The 2000 census reported a population of 23,250 inhabitants. The largest town is Riverton. Headquarters are at Fort Washakie. Also home to the Wind River Casino (Northern Arapahoe) and Shoshone Rose Casino (Eastern Shoshone), which are the only casinos in Wyoming. Duck Valley Indian Reservation was established as a homeland for members of both the Shoshone and Paiute tribes. It lies on the state line between Idaho and Nevada in the western United States. Archaeological record attests to the use of these areas for over 15,000 years. These people had villages along the Snake, Bruneau, Owyhee, Boise, Payette, Salmon and Weiser Rivers and their major tributary streams in southwest Idaho. Fishing, hunting, and gathering provided the basis for our ceremonial, subsistence, and economic livelihood. Salmon was the single most important resource. 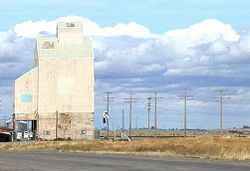 Ely Shoshone Indian Reservation is an Indian reservation for the Shoshone people of Nevada, in and near the south side of the city of Ely, in south-central White Pine County. In 2005 it had a population of around 500, a textile business, and its own court system. The Goshutes, a Shoshonean people, maintained a territory in the Great Basin extending from the Great Salt Lake to the Steptoe Range in Nevada, and south to Simpson Springs. The tribe once numbered 20,000. Only 500 remain. The name Goshute derived either from a leader named Goship or from Gutsipupiutsi, a Shoshonean word for Desert People. Prior to contact, the Goshutes wintered in the Deep Creek Valley in dug out houses built of willow poles and earth. In the spring and summer they gathered wild onions, carrots and potatoes, and hunted small game in the mountains. The Confederated Tribes of the Goshute Reservation are composed of Goshute, Paiute and Bannock. The reservation lies on both sides of the Nevada-Utah border, in White Pine County in Nevada, and in Juab County and Tooele County in Utah. It has a land area of 459.517 km² (177.42 sq mi) and a resident population of 105 persons was counted in the 2000 census. Located about half-way between the Goshute Reservation and Salt Lake City, Utah is the Skull Valley Band of Goshute. The tribe consists of about 125 people, of whom 31 live on an 18,000 acre (73.004 km²) reservation in Utah. The Dugway Proving Grounds lies just south of Skull Valley. To the east is a nerve gas storage facility and to the north is the Magnesium Corporation plant which has had severe environmental problems. The reservation was a proposed location for an 820 acre (3 km²) dry cask storage facility for the storage of 40,000 metric tons of spent nuclear fuel. Only 120 acres are for the actual facility, and the rest of the land is a buffer area. After more than eight years after application, this facility was licensed by the NRC. The Reno-Sparks Indian Colony is an urban Native American Tribe comprised of members with Washoe, Paiute and Shoshone heritage. The Tribe has a colony in central Reno, Nevada and a reservation in Hungry Valley, which is about 15 miles north of Reno. The colony started out as a neighborhood in Reno where Native Americans who worked in local businesses and ranches lived. Under the Indian Reorganization Act of 1934 these people formed a tribal government. The Tribe was later granted land in Hungry Valley for a reservation. The Fort Hall Indian Reservation is an Indian reservation of the Shoshoni and Bannock people in the U.S. state of Idaho. It is located in southeastern Idaho on the Snake River Plain north of Pocatello, and comprises 2,110.514 km² (814.874 sq mi) of land area in four counties: Bingham, Power, Bannock, and Caribou counties. Founded in 1863, it is named for Fort Hall, a trading post that was an important stop along the Oregon Trail and California Trail in the middle nineteenth century. The ruins of the fort are located on the reservation. 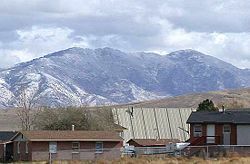 The community of Fort Hall, along Interstate 15, is the largest population center on the reservation. The total population of the reservation was 5,762 at the 2000 census. The reservation was established by an agreement between the United States and the Shoshone and Bannock tribes in the wake of the Bear River Massacre, in which the United States Army under Colonel Patrick Edward Connor slaughtered over 200 Native Americans in present-day southeastern Idaho. The massacre was the culmination of a long struggle between the Shoshoni and U.S settlers, which included numerous attacks by both sides. The Shoshoni, led by Chief Pocatello, were motivated to attack emigrant parties in part because of the despoliation of natural resources in the region by the increasing tide of settlers. The Mormons, led by Brigham Young, had subsequently pursued a policy of reconciliation with the Shoshoni, but the arrival of the U.S. Army into the Utah Territory in 1858 led to a full-scale conflict between the U.S. and the Shoshoni. Connor led his troops from Fort Douglas in January 1863 in order to "chastise" the Shoshoni. Pocatello was able to receive advance warning of Connor's advance and led his people out of harm's way. He subsequently sued for peace and agreed to relocate his people to the newly-established reservation along the Snake River. The U.S. government agreed to supply the Shoshoni annually with 5,000 dollars in goods. The reservation, located on the open plains, was not especially amenable to agriculture, and the U.S. government did not always fulfill its obligation of payment of goods. In the years following their relocation, the Shoshoni suffered from disease and hunger. Hoping to relieve his people's suffering, Pocatello led them to a missionary farm in the Utah Territory to receive mass baptism and conversion to Mormonism. Although the Shoshoni received baptism, the local population of settlers agitated for their removal. In response, the U.S. Army forced the Shoshoni back onto the reservation. The main agriculture on the Ft. Hall Indian Reservation today is the cultivation of wheat and potatoes. The reservation has recently become the site of a casino, The Fort Hall Casino, operated by the Shoshone-Bannock tribes along Interstate 15, exit 80, north of Pocatello. ↑ Henry E. Stamm, IV, People of the Wind River: The Eastern Shoshones, 1825-1900. (Norman, OK: University of Oklahoma Press, 1999. ISBN 978-0806131757), 23-40. ↑ Washakie Architect of the Capitol Retrieved November 11, 2007. ↑ Washakie Architect of the Capitol. Retrieved November 11, 2007. ↑ Native Americans in Early Nevada Taken in part from :Helen Dunn, Indians of Nevada. (Nevada Department of Education)-, 1973) And in part from the Nevada Department of Cultural Affairs Web Page. Retrieved November 20, 2007. ↑ The Officer Down Memorial page Policeman Edward Hogle Retrieved November 20, 2007. ↑ Inventory and Assessment of Native American Human Remains from the Western Great Basin, Nevada Sector, in the National Museum of Natural History Region: Great Basin Associated Cultures: Bannock, Paiute, Shoshone, Washoe. 1992. Smithsonian Institution. Retrieved November 20, 2007. ↑ Western Shoshone History Wells Band of Western Shoshone Retrieved December 11, 2007. All links retrieved September 15, 2015. This page was last modified on 15 September 2015, at 16:49.